More than 130 migrants went missing on Tuesday morning when two boats capsized off the coast of Djibouti. The International Organization for Migration (IOM), the United Nations agency for refugees and migrants, said the boats capsized about 30 minutes after leaving shore because they were overloaded as they headed into large waves, according to witnesses near Godoria. The town on the Gulf of Aden is in the Obock region of northeastern Djibouti. The local residents notified local gendarmes who began a search and discovered two survivors as well as five fatalities. 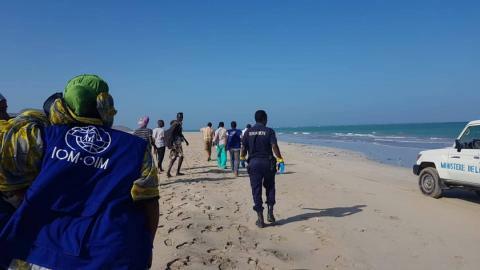 Djibouti’s coast guard also was notified and launched a search and rescue mission. The IOM Djibouti staff said they talked to an 18-year old man who survived from the first boat and said there were 16 women in his group. He did not have information about the second boat. Many of the migrants who travel on the Horn of Africa routes are trying to reach Gulf Cooperation Council (GCC) nations and come from Ethiopia. IOM manages a Migrant Response Center (MCR) in Obock, where more than 500 migrants are being assisted ahead of repatriation to their countries of origin, but the agency did not say where this particular group of migrants came from. A November 2018 report from IOM Djibouti said some 2,000 migrants each day transited through Djibouti, Ethiopia and Somalia during the first six months of last year. About 35 percent of nearly 400,000 migration journeys in that period had the GCC nations as a destination.